Just Toys Classic Cars is proud to present a great looking work horse of a truck that needs to be in your fleet today. This is a 2002 Ford F350 Turbo Diesel Dually. This was the top of the line for Ford in 2002. This truck for it's age looks absolutely great. Normally, you see these truck with tons of dents, rust, and generally tons of problems. This truck does not have any of that. Sure it has a couple of door dings here and there, but nothing like you normally see. 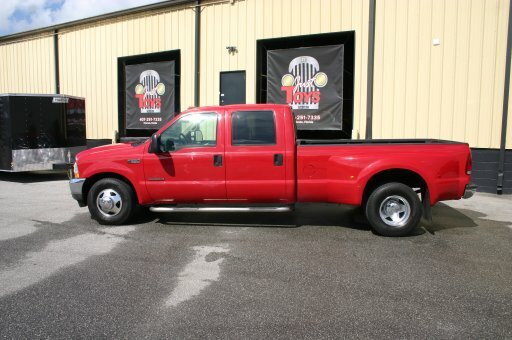 The red paint on this truck is in great shape, and as you will see in this pics shines up like it is brand new. We all know how hard it can be to make red paint stay shinny. Mostly with these trucks because they do not fit in to a lot of normal garages so they spend a lot of time outside in the elements. This one has been well maintained and you will be very happy with it. Ok, so we have talked about the paint and the body, but what everyone wants to know about is the diesel under the hood. Under the hood of this street beast sits the 7.3 Turbo Diesel. This motor then and now has been the work horse in the Ford fleet. It is a bullet proof motor that just keeps running, and running. This motor to Ford people is like what the 5.9 is to Dodge people, or the 6.6 to Chevy people. The things that you find on older diesels of any brand are no problem with this truck. The injectors are in great shape, the pressure control module is brand new. This truck fires up and runs awesome every time you ask it to. It does have a brand new A/C compressor that makes the air blow down to 40 degrees. There is a new power steering pump and lines as well. Like we said, everything that you need to work great on this truck does. The interior is also in great shape for the age of the truck. It is cloth interior front and rear. There is a little bit of wear on the front cushion on the driver side, but not ripped all the way through. The radio, cd, and cassette, yes I said cassette player all work. This truck has a tilt wheel, cruise control and they work as well. All of the gauges work just like they should. This is a very comfortable truck to drive. Underneath is rust free as this truck spent the majority of it's life in TX. As you see in the picks, it does have the rear hitch as well as a goose neck already installed. This truck is ready to haul anything that you want to put behind it as it will tow 13,500 by the goose neck. This is just one cool truck that is going to run you forever. We have seen these 7.3's get over a million miles on them. This is a truck that you just have to own. We do offer financing even on 13 year old trucks so don't think that you have to take all of the cash out at once. Put 20% or more down and have some really cheap payments. We look forward to speaking with you soon, and we look forward to making you the newest member of the Just Toys Classic Cars family.